BUTTERSCOTCH BAKELITE Vintage Jewelry CAMEO BROOCH Pin Celluloid HUGE 2-5/16. 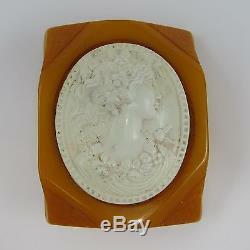 A huge vintage Butterscotch Bakelite Cameo Brooch. 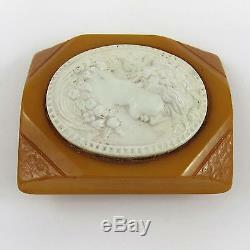 We are pleased to present this vintage Butterscotch Bakelite Cameo Brooch for your consideration. In addition to the ornate Cameo in the center, the piece features beveled and textured corners, along with concave sides. The Brooch measures 2-5/16 inches high, 1-7/8 inches wide, and about 3/4 inches deep. The Cameo in the center is oval in shape, measuring 1-3/4 inches high by 1-1/2 inches wide. Total weight of the piece is 1.4 ounces. There are no identifying marks on it, or on the metal pin that is attached to the back. The metal pin has some light surface rust, but is fully functional. The Bakelite and Celluloid surfaces show normal age appropriate surface wear with some spots of dust, but are free of any significant damage. We rate the overall condition of this piece as very good. 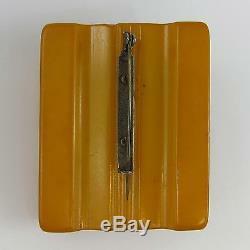 This is an impressive looking vintage Bakelite Brooch with a classic design and look. It would make a wonderful addition to any collection! Looking for more great Antiques? If you have any questions regarding this or any of our other items, please feel free to send us a question! Scroll down towards the bottom of this listing to find the "Ask a Question" link. It is under "Questions and answers about this item" on the left hand side. Studio Antiques has been supplying Southern California traders, retailers & consumers, with great pride since 1985. We are direct importers of European furniture and collectibles. We have thousands of interesting and unusual items at great prices! The item "BUTTERSCOTCH BAKELITE Vintage Jewelry CAMEO BROOCH Pin Celluloid HUGE 2-5/16" is in sale since Monday, September 23, 2013. This item is in the category "Jewelry & Watches\Vintage & Antique Jewelry\Costume\Bakelite, Vintage Plastics\Pins, Brooches". The seller is "gimbler" and is located in El Segundo, California. This item can be shipped worldwide.